Suppose you're a landowner in Germania, just west of the Rhine. It is the 2nd Century A.D. You own a number of farms, a couple of good houses, maybe some slaves, some of whom are on the verge of buying themselves out. You've just paid your taxes. The publican whose duty it is to collect taxes in your area sends his agents to you demanding you pay again. Something has gone wrong somewhere, the publican's office is short of the expected budget. It's a shakedown, pure and simple. You tell the agents they're mistaken. They tell you they don't care, and you'd better pay up right now. A dozen cutthroats show up armed to the teeth to back up the agents' claim. You've got no choice. You pay. The following week, the agents show up again, accompanied by two dozen cutthroats this time, and simply tell you that you have to vacate the premises now: your land, with everything on it, belongs to the publican, effective immediately. You tell them the land has been in your family for three generations. They call you a liar. "Prove that a) they made you pay twice and b) that they're illegally expropriating your estate." What kind of proof would you have to present? Documents? A plaque? Would you have to produce witnesses who could confirm that the land is rightfully yours? Would there be a record in the Quaestor's office over in Rome? Would you, as the owner, have a copy of that record? Signed by whom? If signatures were important, who'd be called upon to verify them, what kind of specialist? The ancient Romans did not use deeds, they used a registration system. The document cited by Semaphore is not a deed, it is a conveyance (everybody now run to the Wikipedia and find out what a conveyance is). Roman land was surveyed and divided by stone markers called limites. In some places the land was divided into regular squares called centuriae. In those cases the owner of each square was recorded. Other times, the land was in irregular bounds, in which case it was individually recorded. There were two main types of records: the subseciva (land owned by the empire/government) and beneficia (land owned by individuals). In well-established places these lists were recorded on bronze plaques, and in more temporary situations they were recorded on wood or other less permanent materials. The example you give would never happen because the ownership of land and its bounds were recorded, so the taxpayer would not have needed to prove anything. The most common source of problems concerning land ownership in ancient Roman involved the culinae, which were public commons located on the outskirts of towns in the margins between the town and regularly owned farmland. This land was supposed to be for the use of the poor in the town, but in many cases adjoining farmers appropriated this land unjustly, leading to disputes of various kinds. There is an ancient document called the Corpus Agrimensorum Romanorum which describes Roman surveying and recording practices in detail. Ancient Rome had land deeds and registrations. Most of it has long since been lost, but there are still plenty of examples. Note that Roman rule lasted a long time and stretched across three continents; unsurprisingly, the exact details of the system in place differed across time and space. 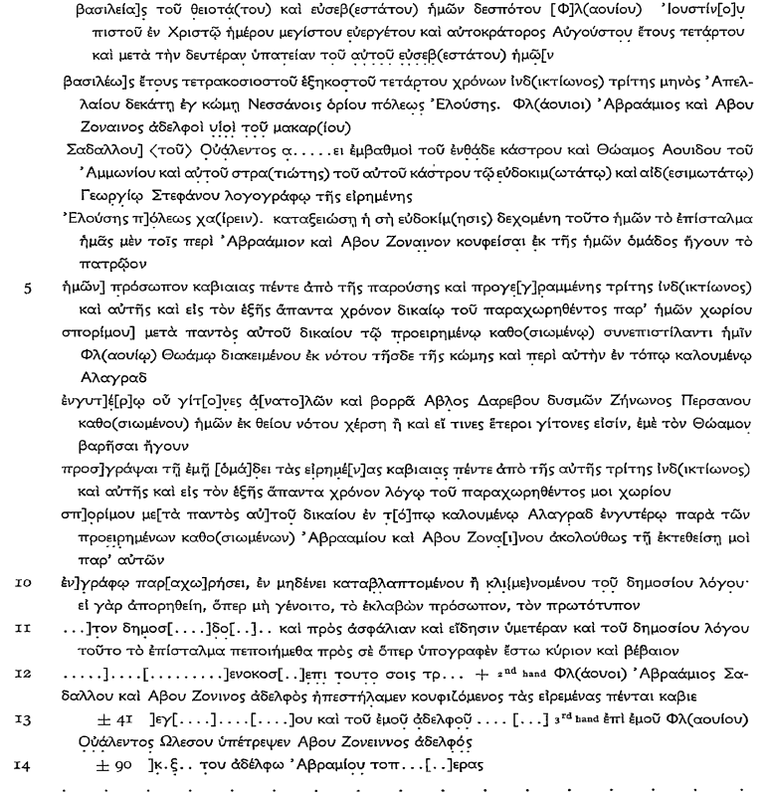 For example, there is a land deed found among the papyri excavated at Nessana, in the Eastern Roman Empire. Probably due to its location, it was written in Greek rather than Latin. 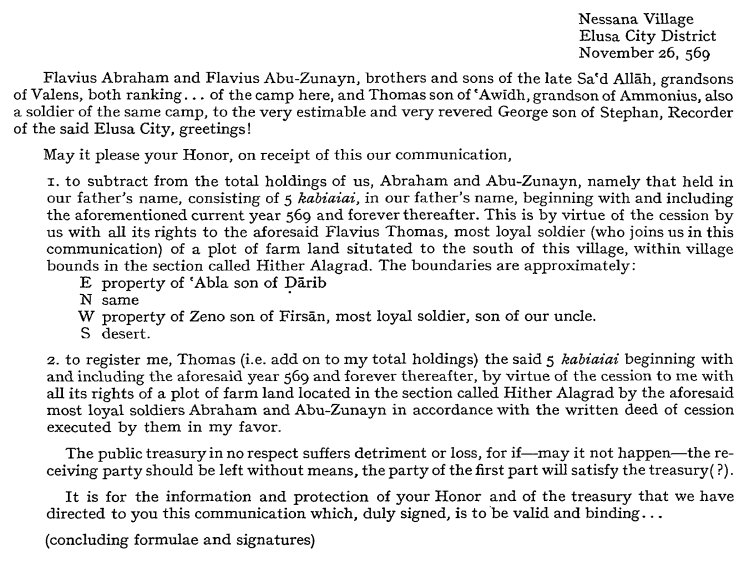 The document notified the Land Office that the brothers Abraham and Abu-Zunayn were transferring a piece of ancestral land to a comrade, Thomas. The boundaries of the property were also spelt out. Not the answer you're looking for? Browse other questions tagged ancient-rome law or ask your own question. Did Ancient Roman insulae reach more than 10 storeys? What rules of the ancient Roman game 'Harpastum' are known?